"“If you don't have the courage to walk alone others will not have the courage to walk with you." "You will never be satisfied with anything less than the highest you can attain." "It is the road you take that decides your destiny and not your destiny that decides the road you take." "You have all the power you need to build the future that you wish." "The price tag you put on yourself decides your worth. Underestimating yourself will cost you dearly." The digital technologies are empowering companies to use technology to transform their operations, respond swiftly to customers, and augment new business models for additional revenue. In a Forrester study, executives predicted that by 2020, 47% of revenue will be influenced by digital technologies. The digital technologies are taking over traditional businesses and companies are looking at transformation strategies to adapt. How businesses prepare for the digital onslaught will dictate their future. The organisations that are lagging behind and not adapting fast enough are losing ground. Digital transformation is a key necessity in todayâ€™s world. There are many companies that have undergone digital transformation successfully. For e.g. Dominoâ€™s Pizza now allows customers to place orders from anywhere and any device. Walmart has emerged as a leading ecommerce platform to complement its retail stores in recent years. Bank of America has introduced self service apps for its customers. Digital transformation is not about technology, itâ€™s about your business. Organisations should clearly define the end goals and objectives for their business when undergoing changes. When the goals and objectives are not well defined, it leads to chaos and confusion. Digital transformation that doesnâ€™t translate end to end processes creates hurdles for the customers as well as internal teams. When operations are digitized, it shouldnâ€™t leave gaps. Whether it is customers or employees, no one likes inconsistencies. The process digitization should be consistent across online and offline interactions. The digital transformation requires careful planning and automation. Organisations that want to do too much too soon end up paying a heavy price for it. Digitization works best when it is done in phases. When everything is done in one go, it leads to panic. The solution: To keep your digital transformation on track, plan and prepare well. It works well when you do it in phases and milestones. For e.g. customer interactions and support can be digitised first. Next you can focus on sales and support. Customer loyalty, retention, employee onboarding, product digitization and other areas can be strategically pursued with key performance metrics. Breaking down digital transformation leads to improved outcomes. It doesnâ€™t overwhelm the team, nor the customers. Digital transformation requires everyoneâ€™s involvement. When top executives, board members and management is not involved in driving changes, it can create trouble for companies. 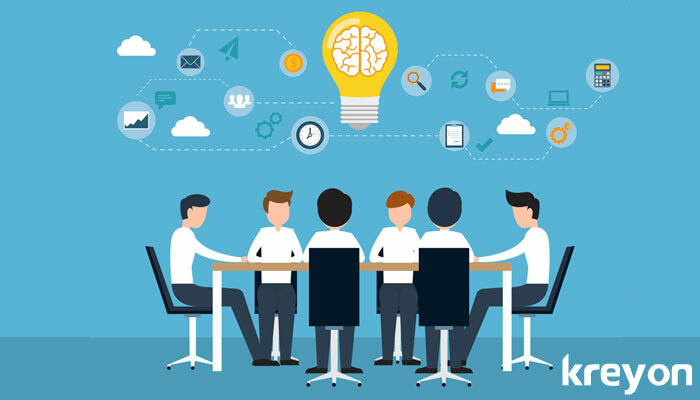 A disconnect between the board and people who are implementing the digital transformation introduces gaps. Poor communication can lead to misalignment of teams, wrong focus areas and ultimately disastrous project outcomes. vision and purpose of the project. The solution: Digital transformation requires creating leadership at all levels. 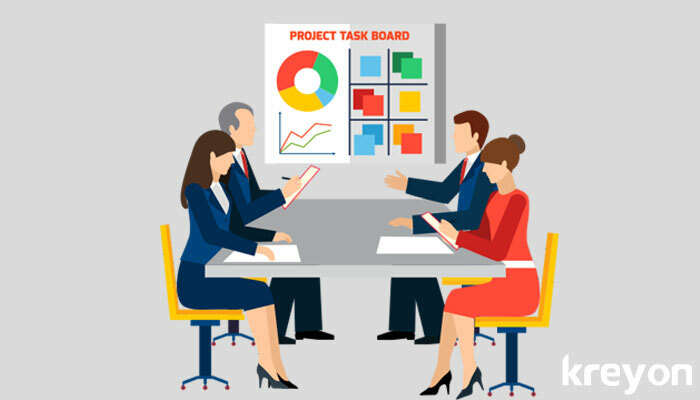 It means connecting with teams, clarifying project objectives and conveying the purpose of the project. The top level management should be involved in driving the changes, they should also be in touch with the people working on the ground to avoid disconnect. Good communication is about seeking feedback from customers and employees throughout the journey. The technology you build today will be outdated tomorrow. There is no respite from competition in the world today. One of the prime objectives of digital transformation is to make organisations more agile and fast paced to deal with ongoing disruptions in the world. Slow and sluggish developments can lead to stagnation and derail the projects. The speed of transformation is crucial to its success. Digital transformation is not about copying others. It is about understanding how technology can improve your core business operations. A lot of companies try to do everything themselves and end up with mediocre results. You cannot build a digital enterprise by copying what others are doing. Businesses need to work with teams that have the skills and expertise required for a successful digital transformation. Engaging experts with deep knowledge of technology and working with them to achieve your desired business goals can lead to better results. Instead of assigning new roles to the current team members, trying to source individuals in house, it is often better to work with dedicated teams and a trusted digital partner with deep expertise. 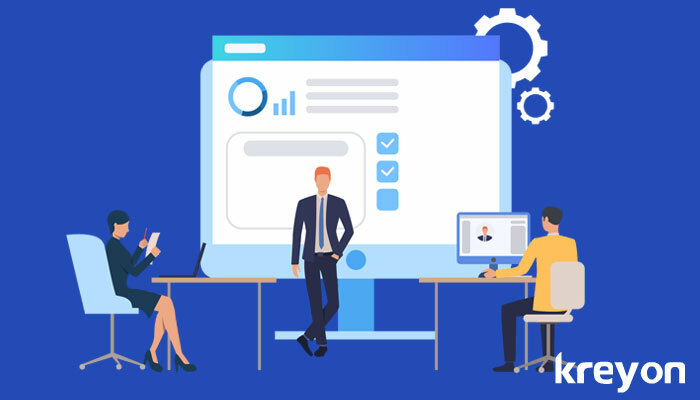 Your digital transformation efforts can go awry because of experience, skills and may eventually fail without expertise in execution. Solid experience and expertise can make the difference the success and failure of your digital transformation. 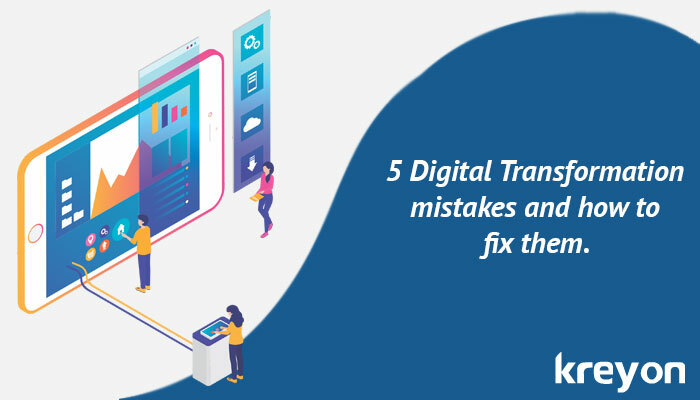 The post 5 Digital Transformation mistakes and how to fix them appeared first on kreyon systems | Blog | Software Company | Software Development | Software Design. Kreyon Systems featured in Silicon Valley Open Doors. For more about our world class products & services.